In 2011, the National Association of County and City Health Officials (NACCHO) surveyed local health departments (LHDs) and conducted eight key informant interviews to learn more about LHD infrastructure and capacity to prevent unintentional injury and violence. ensure ongoing training and support to increase capacity of all LHDs to identify health disparities, address health inequities, monitor local data and trends, and assess impact of local prevention efforts. 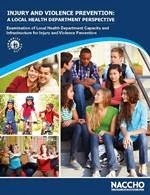 Access the Injury and Violence Prevention: A Local Health Department Perspective: Examination of Local Health Department Capacity and Infrastructure for Injury and Violence Prevention report for free on NACCHO's website.